Big welcome to our new members this week: April 1st - 8th! Hi all, my name is Daniel I’m 28 and from the UK in sunny old Lincolnshire near a small town which the locals call skegvegas proper name Skegness for those that don’t know​:grin:. I’ve always had a interest in Motorsport, avid follower of the F1 and touring cars which my dad was always watching them so stemmed from that really. He has a karting trophy in the cabinet from his youth not really asked about that if I’m honest, he still has a blast around the small croft track every week just about, however my experience is limited to a track day in a lotus exige with my old man and an hour or so karting in some little gx270s. 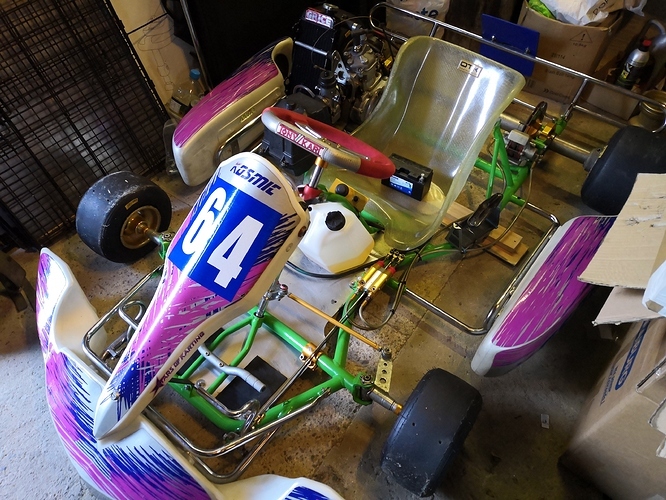 Since that hour session the bug bit hard and I bought a older Tony kart venox chassis off a work colleague, sourced a rotax Max senior engine and have been building it up slowly and getting it setup ready for its first outing. Glad to be part of the community, going to be a blast, thanks to my mechanical background I’m quite technically minded so anything i learn along the journey il be sure to help out where I can and give back to the community as I gain more experience. Welcome. Your kart looks very nice and I like the green tony frame with the Kosmic colors. I’ve always been a bit jelly of you U.K. people with your rental racing. Did you do the BUKC series that college kids in the U.K. can do? The whole idea of club rental college racing is just so awesome or am I totally misunderstanding it? Cheers Dom, I wasnt too keen on the colours at first but the chassis was straight and freshly powder coated with no flat spots so I jumped at the chance, it was meant to be a replacement for a work colleagues father but didn’t get used. Anyway it’s growing on me but still in two minds. I haven’t done any other karting other than the hour session I did with my dad and a few mates (actually for my stag do) and as it was at the place my dad runs with his best mate who owns it it was free so bonus. Other than the arrive and drive type rental I have no idea how the rental racing works I’ve heard of it and seen a few adverts kicking about and it seems a good way of getting into the karting life and participating in club level racing. thank you for the warm welcome. My name is Dom im 33 and from Ireland, (Dublin). I have only just got into karting but i have loved motorsports all my life. I don’t really have much experience racing karts but i had been sim racing for the past 3 years and wanted to try get into some real racing. Hi Dom cheers mate, just needs a little bit of setting up and il be out and about soon hopefully. It’s very fun to me that there’s another Dom from outside of Dublin. My family hails from the Dublin area on my fathers side. However, my Dom is short for Dominique (mother was French).